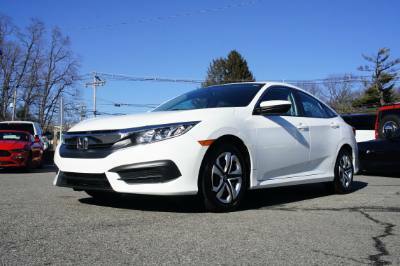 2018 Honda Civic LX Dealer Warranty, 1-Owner, Non-Smoker, Accident Free Carfax, Back-Up Camera, Bluetooth. We are pleased to offer extended service warranty contracts. Various types and levels of coverage may be available, from basic "peace of mind" to "bumper-to-bumper". Service may usually be performed at most licensed mechanical shops in most states and, with some plans, Canada. Plans offer many additional benefits, including emergency towing service, battery service, flat tire service, lock-out service, emergency fuel and fluid delivery. Please ask one of our Extended Warranty specialists for details. When you buy any type of vehicle, it might be a good idea to afford yourself the protection that a warranty can provide. This is especially true when buying a pre-owned vehicle. Most vehicles offered by us are eligible for extended warranty, offered either by manufacturer or third-parties. Such warranty purchase is an additional cost above the purchase of this vehicle. It is not included in the final sale amount. For your financial convenience, and depending on how you plan to pay for the vehicle, you might be able to incorporate the cost of the warranty into your vehicle financing, or you may opt to pay for the warranty separately. Existing extended warranties might be subject to a transfer fee. *Certain requirements, limitations or exclusions may apply. *in general, warranty transfers are handled by respective warranty companies. Transfer fees commonly range from $50-100. Whenever aware of, we will gladly advise you on their policies, procedures and charges. We will gladly help you find this information at the time of vehicle purchase and/or will point you in the right direction to ensure that you understand them.